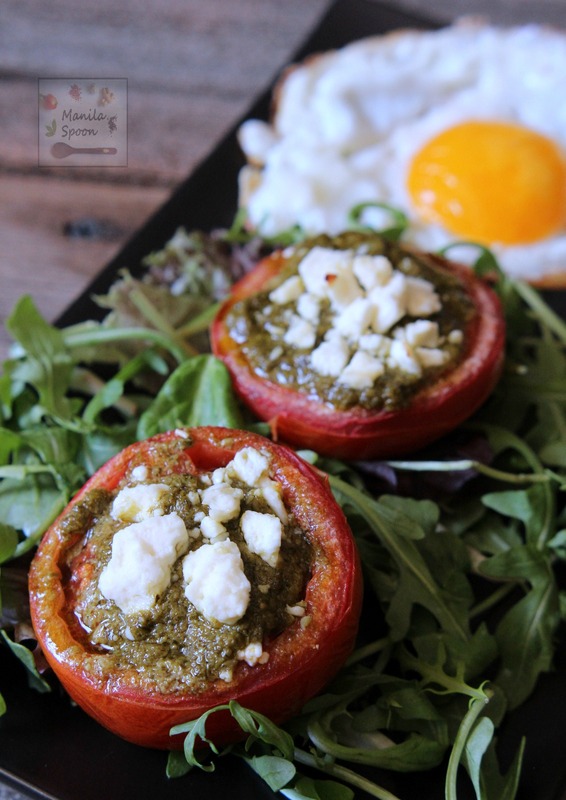 Deliciously good, easy and healthy breakfast or brunch solution – Baked Tomatoes with Pesto and Feta Cheese. Completely gluten-free and low-carb, too! I am not a breakfast cereal kind of person. Perhaps because I grew up eating rice and meat for my first meal of the day that my body seems to always crave something savory and more substantial. For this reason, I am often on the look-out for new breakfast recipes to try, preferably savory and gluten-free, and low-carb, if possible. One of my favorite breakfasts ever is English breakfast which has eggs, sausages, tomatoes, bacon, beans and mushrooms and usually with a piece or 2 of toast. Now, if you simply remove the toast then it’s a completely gluten-free fest and also a delight for any protein lover! That’s me! Inspired by the fried or grilled tomatoes in the English breakfast menu, I decided to make it a little more substantial by adding some toppings to it. I just bought some pesto and feta cheese the other day and I thought a combination of these with juicy tomatoes would just be fabulous. I am glad it came out really tasty and my palate was totally pleased. I decided to bake this although you can certainly broil it if you prefer – just adjust the time (certainly less than 10 minutes). 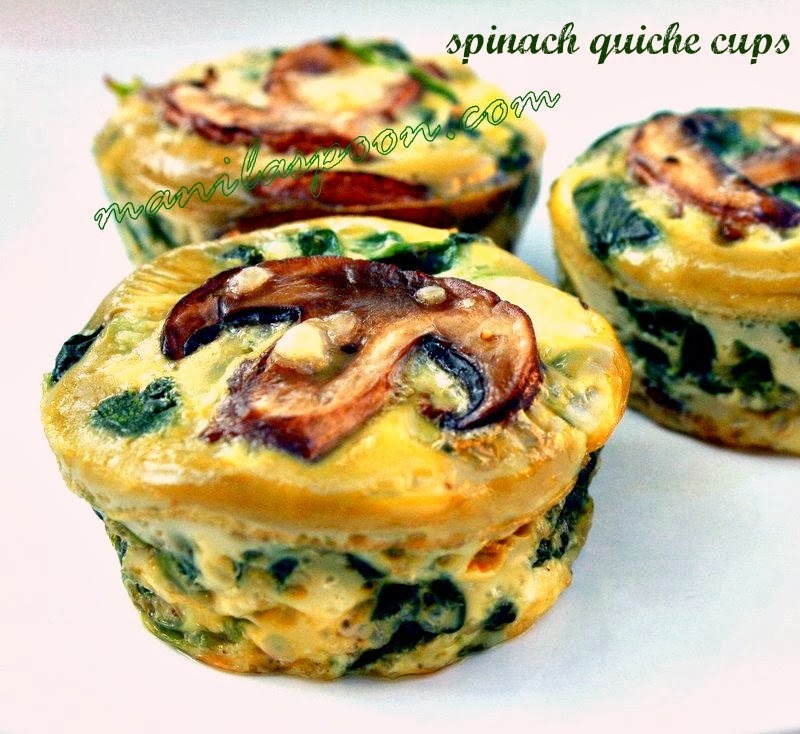 For a completely low-carb and gluten-free breakfast, I paired these with some fresh greens and fried eggs. The meals is satisfying and would leave you full for a few hours. Now, that is my kind of breakfast indeed! Can you see juicy-ness and deliciousness all over? Enjoy! Preheat the oven to 400 F. Slice the tomatoes in half and place cut side up on a baking sheet. Divide the pesto sauce equally among the halved tomatoes (about a teaspoon each) spreading it to cover the entire top. Sprinkle with some feta cheese on top, about 1 teaspoon each or to taste. Bake for about 10 minutes or until the tomatoes are tender but not mushy. Serve immediately. We love baked tomatoes in our house, especially with a big salad. 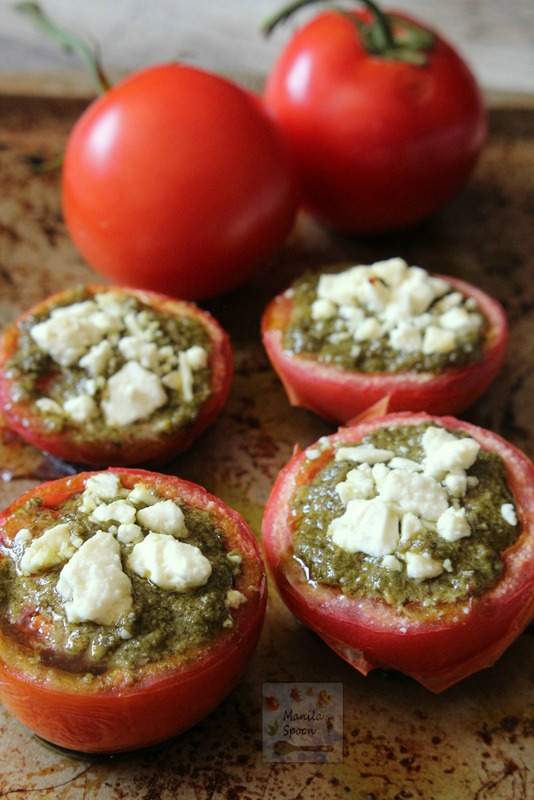 There is so much that you can do with them, but pesto and feta sounds incredible. Thanks Dannii! It was flavorful, indeed! Hai Abby… such an easy and quick meal to go! love it..! So simple but so delicious!! 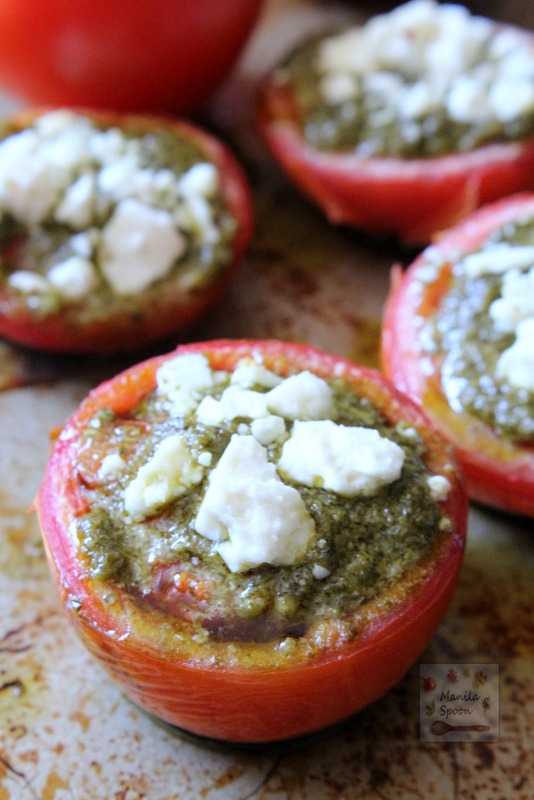 I also love the combination of tomato, pesto and goat cheese. I grew up eating spaghetti for breakfast so I am with you on that. I still eat dinner leftovers for breakfast because I don't eat it until 10. I work out from 830-930 and drink a small protein shake then. They only time I eat breakfast foods is on the weekends when we go out as a family. Can't wait to try these gorgeous tomatoes! Those tomatoes would be fabulous for breakfast with a soft fried egg! 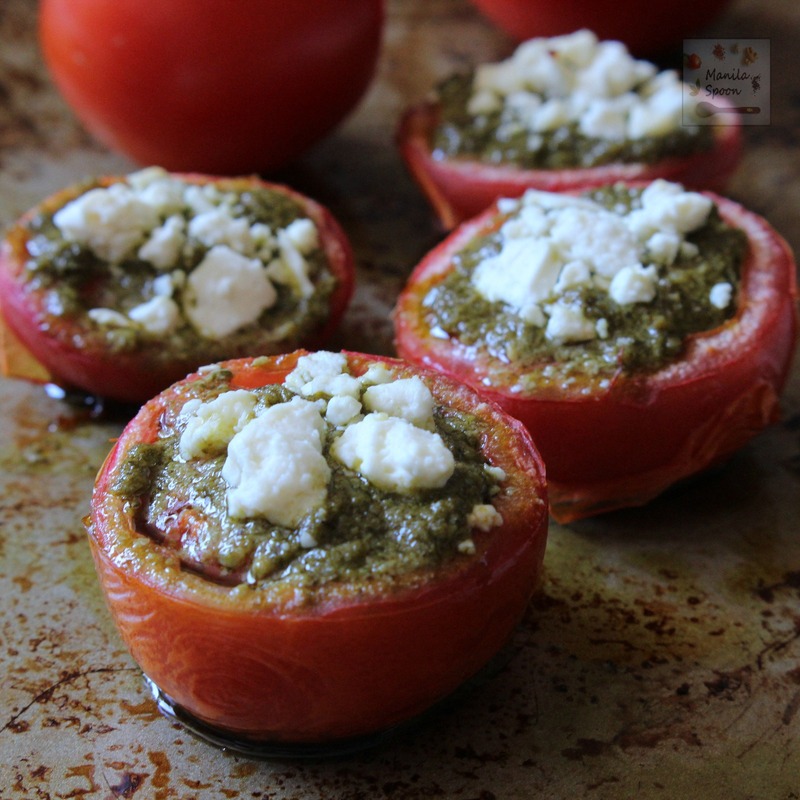 These sound wonderful – tomatoes, pesto and feta are the perfect combination! You had me at tomatoes. 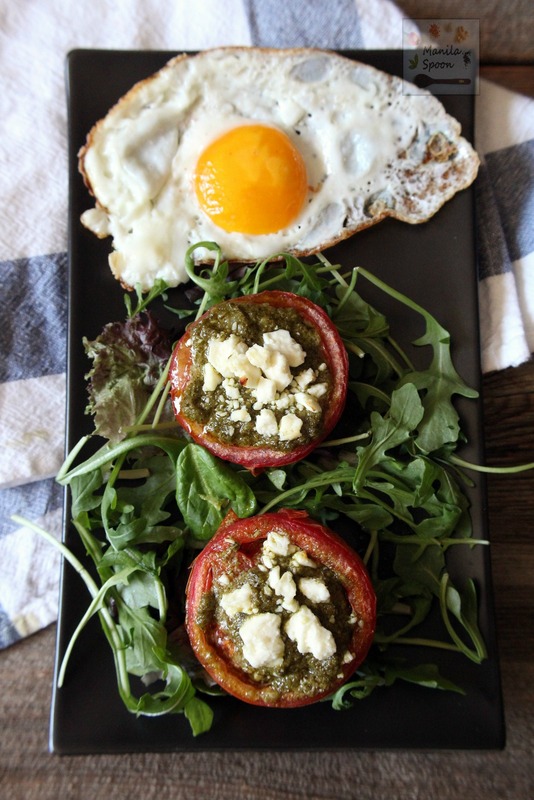 I am a huge fan of baked tomatoes and this recipe of stuffed tomatoes with pesto is exactly what I need for comfort food. Great recipe!